The country of origin of the Golden Hamsteris Syria. The Golden Hamster falls under the �Rodentia� animal class. 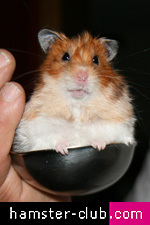 There are approximately 14 hamster species and may live up to 3 years. 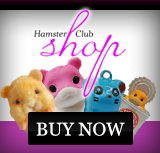 An adult Golden Hamster�s weight is 120grm for a female and 108grm for a male. Their estrus cycle is 4 days but sometimes can also be 5 days. 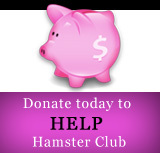 The Golden Hamster's gestation period is approximately 16 days. The Golden Hamster's litter size is around 6-8 but there were cases where litter was from 2-12! The hamster babies are born naked, blind and the age of weaning is 21 days. The hamster's sexual maturity is reached at 6-8 weeks.